Volunteer recognition is a key priority of our Volunteering Strategy. We want our volunteers to feel appreciated and valued for their contributions and we have a range of ways to say thank you, including our Shining Star award. Who deserves a Shining Star? We award Shining Stars to volunteers and groups of volunteers whose outstanding service and achievements exemplify the positive impact we always strive to make within our MS communities. 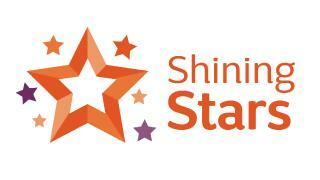 Any volunteer or staff member can nominate a worthy volunteer or group of volunteers to receive a Shining Star. Read our guide, How to nominate a Shining Star before you submit a nomination. The easiest way to submit your Shining Star nomination is to complete our Shining Star Online Nomination Form. You’ll receive an automatic response to let you know we’ve received your nomination. You can use either of our forms to submit a Shining Star nomination for an individual volunteer, or an outstanding group project. If you need to nominate more than 10 volunteers who have taken part in a group project, please contact our Volunteering Team. If your group nomination is approved, each nominated volunteer will receive a Shining Star lapel pin and a certificate. The Shining Star Panel meets every two months to consider nominations. Our Volunteering Team will contact you to let you know when your nomination is due to be considered and again when the decision has been made. If your nomination was successful, we’ll send the lapel pin/s and certificate/s to the address you have provided and record the award on each volunteer’s record on our database. Our Volunteering Team is here to support all our volunteers throughout their journey with us.